But what’s the problem? What is she talking about? Well, the problem is that a cell phone is the first device, which emit microwaves just near our brain while we are keeping them near the ear. And when the technology has been developed, nobody knew the possible effects of such kind of proximity for our health. Does anyone know now? Yes, science knows the univocal answer at least a decade or more. Let’s see the facts. As yearly as in 2001, a group of Swedish oncologist Prof. Lennart Hardell published epidemiological study in the European Journal of Cancer Prevention, where they firstly demonstrated that use of a cell phone increased the risk of brain tumors 2.4 times on the same side of the head where the phone was used . Those were histopathologically verified cases on Swedish cell phone users and matched control population. In 2003, the Hardell’s group reported in the International Journal of Oncology, that the risk of acoustic neuroma increased in Swedish users of cell phones 4.4 times on the same side of the head where the phone was used . Acoustic neuroma is a benign tumor of acoustic nerve, which goes from the ear to the brain. The malady results in chronic pain and hearing loss. Next year, Hardell with colleagues revealed that among all analyzed age groups of adults the most vulnerable was the youngest group aged 20-29 years. This group had 8-fold increased risk of brain tumor development after 5 years of cell phone use as compared to peer non-users of cell phones . In the same year, the other Swedish research team published the data, which confirmed almost 4-fold increased risk of acoustic neuroma on the same side of the head as the phone was normally used in Swedes after 10 years of cell phone use . Later these data were also confirmed by Japanese scientists, which detected 3-fold increased risk of acoustic neuroma in Japanese just after 20 minutes or more daily cell phone’s talks during 5 years . In 2006, the group of Hardell published the next results of their epidemiological research, which demonstrated that the risk of glioma, the most aggressive type of brain tumor, increased in Swedes 5.4 times after 10 years of cell phone use on the same side of the head where the phone was applied . In 2008, Israeli scientists discovered another target for cell phone/smartphone radiation, which is parotid gland. These salivary glands are situated just near the ear and are exposed to microwaves every time when we are talking on a cell phone. The researchers revealed that those people who talked on a cell phone 3 hours a day during 5 years had 2.3-fold increased risk of parotid malignant tumor . Moreover, the researchers demonstrated 4-fold growth of parotid gland cancers over the country from 1980th to 2006, while the other salivary gland cancers remained stable . See the graph from this work below. Carcinogenic effects of cell phone radiation were confirmed in sound International project Interphone. Research teams from 13 countries under the auspice of the World Health Organization were involved in the epidemiological study with total budget about 25 M dollars. The only aim of the study was to assess a possible link between cell phone radiation and brain tumors. Despite fair criticism of the project’s design, its financial dependence on the industry and uncertain final conclusions, the project clear confirmed the significantly increased risk of brain tumors in heavy users of cell phones. Say, according to the project findings, persons, who talked on a cell phone 1 hour a day during 4 years had 3.8-4.8 time increased risk of brain cancers (glioma and meningioma) and 2.8 time increased risk of acoustic neuroma [9, 10]. And now is really bad news. Cancer development is a slow process, which can last a couple decades. For example, Hiroshima radiation induced peak of cancers among exposed population 30 years after the nuclear bombing. The other example, today, 30 years after the Chernobyl nuclear accident, Ukrainian population still have a stable increase of thyroid cancer in the affected regions, while the first cases were registered in a few years after the accident. This means that all those data on cancer risk in cell phone users after 5-10 years of microwave exposure can be just the precursors of really big problems. Maybe you know, in 2011 the World Health Organization officially classified cell phone radiation as possibly carcinogenic to humans. But officials didn’t change or recommended to change any safety limits on microwave exposure from the wireless devices. They even didn’t promote this information to the public. They are waiting. Meanwhile “experts” from industry repeat the mantra that they don’t see any harmful effects of cell phone radiation and don’t know mechanisms how it can be realized. So, about the mechanisms. Recently, our research team published a scientific paper on the mechanisms of biological effects of cell phone radiation . The paper had good feedbacks from the scientific community and sound reaction of media. The New York Daily News cited us “These data are a clear sign of the real risks this kind of radiation poses for human health.” Indeed, our analysis demonstrated that the majority of experiments over the world, including our own data, had detected significant oxidative stress in living cells under cell phone radiation exposure. Just as if we expose them to ionizing radiation, smoking or chemical toxins. We have shown that molecular mechanisms of potential carcinogenicity of cell phone radiation are rather understandable today. It is not kind of unexplained phenomena as the experts from industry try to present it. So, what can we do just now to reduce the risks? Throw away our iPhones and Samsung Galaxy’s? No way! We know it’s impossible. But we can use them smarter, I mean safer. Just as you use safety belt in a car or sunscreen on the beach, you can use some safer options while using a smartphone. These options are simple and generally available like using wired earpieces, avoiding excessive conversations on a smartphone and so on. 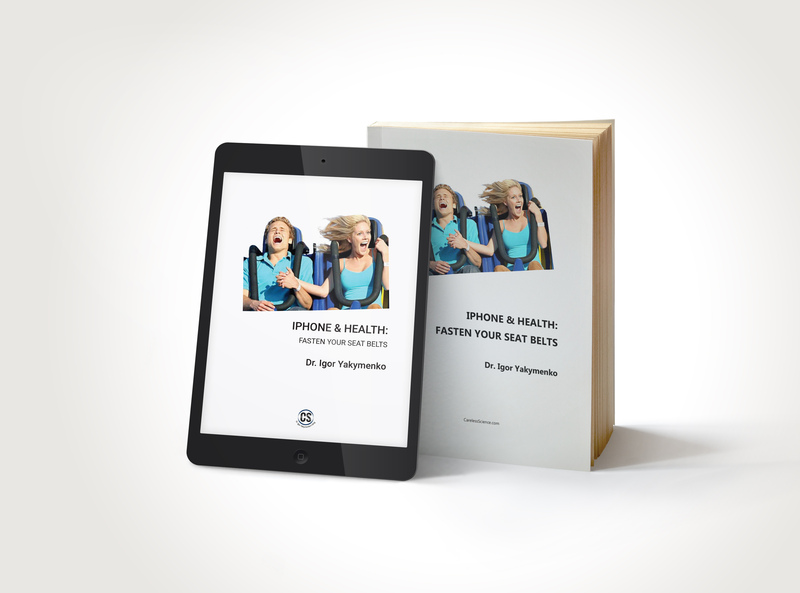 See detailed tips in this post and even more in my free eBook “iPhone & Health: Fasten Your Seat Belts”. Hardell, L., et al., Ionizing radiation, cellular telephones and the risk for brain tumours. European Journal of Cancer Prevention, 2001. 10(6): p. 523-529. Hardell, L., K.H. Mild, and M. Carlberg, Further aspects on cellular and cordless telephones and brain tumours. International journal of oncology, 2003. 22(2): p. 399-408. Hardell, L., et al., Cellular and cordless telephone use and the association with brain tumors in different age groups. Archives of Environmental Health: An International Journal, 2004. 59(3): p. 132-137. Lönn, S., et al., Mobile phone use and the risk of acoustic neuroma. Epidemiology, 2004. 15(6): p. 653-659. Sato, Y., et al., A case-case study of mobile phone use and acoustic neuroma risk in Japan. Bioelectromagnetics, 2011. 32(2): p. 85-93. Hardell, L., M. Carlberg, and K.H. Mild, Pooled analysis of two case–control studies on use of cellular and cordless telephones and the risk for malignant brain tumours diagnosed in 1997–2003. International archives of occupational and environmental health, 2006. 79(8): p. 630-639. Sadetzki, S., et al., Cellular phone use and risk of benign and malignant parotid gland tumors–a nationwide case-control study. Am J Epidemiol, 2008. 167(4): p. 457-67. Sadetzki S., Chetrit A., Jarus-Hakak A., et al. Cellular phone use and risk of benign and malignant parotid gland tumors–a nationwide case-control study. Am J Epidemiol, 2008. 167(4): 457-467. Cardis, E., et al., Brain tumour risk in relation to mobile telephone use: results of the INTERPHONE international case-control study. Int J Epidemiol, 2010. 39(3): p. 675-94. Interphone, Acoustic neuroma risk in relation to mobile telephone use: results of the INTERPHONE international case–control study. Cancer epidemiology, 2011. 35(5): p. 453-464. Yakymenko, I., et al., Oxidative mechanisms of biological activity of low-intensity radiofrequency radiation. Electromagn Biol Med, 2016. 35(2): p. 186-202.